Shows the ROM and CAS version numbers, memory free in each port, value of the contrast, and number of objects in all ports. Contains a large number of computer algebra commands similar to those in the HP 49 and the TI-92+, including EXPAND, FACTOR, PARTFRAC, GRADIENT, DIV, HESS, PREVAL, TABVAL, LINSOLVE, XNUM, AXL, AXM, PCAR, REF, CUMSUM, MEDIAN, TWOVAR, POLEVALM, CUMPROD, and much more. Documentation for CAS48 in Word and HTML format. Adds some computer algebra commands, similar to TI-89/92+ and Derive 5.02, including GRADIENT, WINTGR, and ROTAT. Includes documentation in Word and HTML format. Viewer, flags, and configuration manager for the HP 49 and HP 48. Supports the Meta Kernel on the HP 48. Text editor compatible with XView and TGV. Table of System RPL and assembly language entry points for the Meta Kernel. New graphical user interface written in User RPL, with GUI dialog boxes for the man-machine interface. Makes choose boxes, icon menu boxes, function menus, text boxes, and input boxes. 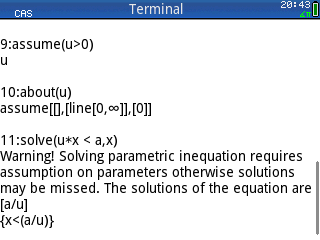 Library functions for the symbolic mode (CAS) of the Prime. 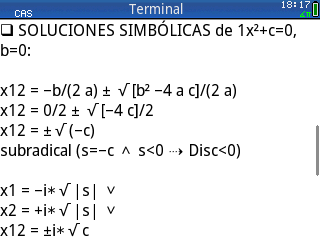 Symbolic or numeric integration by means of tables. PacMan Plus with four levels plus five new ones by Lilian Pigallio. However, this is missing the title screen, the high score, and the score/level screen. Solves quadratic equations in a step-by-step fashion. Requires QPI. Modified version of HPSauce, with faster algebraic visualization of objects and DISPLAY modes. Requires UFL. Replacement stack for the HP 49. Yet another periodic table of the chemical elements. Some elements use French names. Emulates a terminal view, including pretty print (math textbook view), multiple fonts (8/7/6/5 pixels), printing of graphics (GROBs), popups (choose, and menus) inside the view, and an input line. 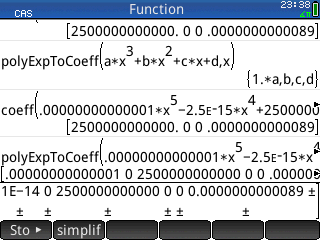 Provides faster algebraic visualization of objects and displays modes of configurations. Contains three libraries, one which requires the Meta Kernel Full Version (on the 48) and one which doesn't (on the 48) and one for the 49/50.